Some world religions have special holy days at this time of year. Jews have Passover, beginning this year on April 20. Muslims have Ramadan, beginning this year on May 5. Roman Catholics have the sacred Paschal Triduum, which is a three-day period beginning with the Evening Mass of the Lord’s Supper on Holy Thursday (April 18) and concluding with evening prayer or vespers on Easter Sunday (April 21). In the Sacred Paschal Triduum, the church celebrates one great liturgy divided over a three-day period. The three days of the Paschal Triduum are preceded by the 40 days of the Lenten season and followed by the 50 days of the Easter season. In other words, Lent ends prior to the evening Mass of Holy Thursday; then there are the three days of the triduum, followed by the 50 days of Easter — 40 and 3 and 50 — almost 90 days of the Lent-triduum-Easter cycle in the liturgical calendar. Holy Thursday (April 18) commemorates the Last Supper of the lord Jesus, the day before his passion and death. At this evening Mass, the Catholic Church celebrates the institution of the Holy Eucharist (“Take and eat, this is my body; take and drink, this is my blood”); the institution of the priestly order (“Do this in memory of me”); and the commandment of fraternal charity (the foot-washing ceremony, or “Mandatum,” from which word we get the designation “Maundy Thursday”). The liturgy ends in silence, with Eucharistic adoration until 11 p.m.
Good Friday (April 19) celebrates the passion and death of the lord Jesus. This liturgy, which begins in silence, has three major parts. The first part consists of scripture readings, with the narrative of the Lord’s passion as found in St. John’s Gospel as the highlight; this is followed by the solemn intercessions for various needs in the church and in the world. The second part consists of the adoration of the holy cross: “Behold the wood of the Cross, on which hung the salvation of the world. Come, let us adore.” Everyone in the congregation comes forward to venerate the cross. The third and final section consists of the reception of Holy Communion from the hosts consecrated at the Evening Mass of the Lord’s Supper. “This is my body, which will be given for you. This is my blood which will be poured out for you.” The liturgy concludes in silence. This Good Friday liturgy takes place at 3 p.m. in most Catholic churches, but at 7 p.m. at St. Hyacinth Church for those who cannot come at 3. 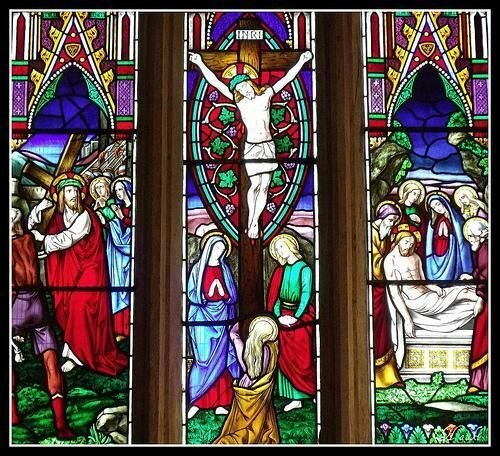 The Passion narrative is sung at St. Mary’s at 3 p.m. and at St. Hyacinth at 7 p.m.
Holy Saturday (April 20) is a day without any liturgical celebration. The church recalls on this day Christ’s “Descent into Hell,” which we profess in the creed. This “descent,” between the time of his Crucifixion and his Resurrection, is known as the “Harrowing of Hell” from the old English and middle English term for the triumphant descent of Christ into the realm of the dead, wherein he brought salvation to all of the righteous who had died since the beginning of the world. The second part of the vigil consists of readings from the Old Testament and New Testament, tracing the history of God’s saving actions, culminating in the singing of the "Alleluia (silenced since the beginning of Lent) and the proclamation of the Easter Gospel of the Resurrection of the Lord. The third part of the vigil consists of the blessing of water and the renewal of baptismal promises, along with the baptism of any adults and/or the reception into full communion in the Catholic church of those baptized in another Christian tradition. The final part of the Vigil is the festive celebration of the Easter Eucharist. Easter Masses of the Resurrection are celebrated on Easter day (April 21), with the triduum itself concluding at vespers (evening prayer) on Easter Sunday afternoon. Catholics should check the individual church for the exact time of the triduum services and Easter Sunday Masses. As Lent draws to a close, Catholics should make the most of this week called “holy” in preparation for the sacred Paschal Triduum! The Rev. Frank E. Lioi is pastor of St. Mary’s Church and SS. Mary & Martha Parish (St. Francis Church and St. Hyacinth Church) in Auburn, and dean of the East Region (Cayuga and Tompkins counties) of the Diocese of Rochester. He can be reached at flioi@dor.org.